You don’t. Such things just happen. And when you do get the opportunity you better take it. Because that is what life is all about; so see the opportunities, then catch them and make sure to do something with them. It took me years to realize the extent of what I was actually doing. That I had started a network of people that, just like myself, value quality and authenticity. In the beginning I thought what I was doing was about bread. But I no longer believe that. The bread was just a perfect door opener. There is something special about bread that we all understand. Bread has a high poetic value regardless of our culture heritage or what religion or class we belong to. Not many things in our world have such a universal quality. My bread is a very simple white sourdough bread baked with flour, water and salt; nothing special about that. But my bread is spiced with the inspiration of earlier trades. My bread is a carrier of tales. Because tales, for me, are the most complex and fascinating flavour enhancer there is. And it is this fourth secret ingredient that makes it special; the tales from good people I have met along the journey. My bread has taken me to Afghanistan. It has opened a door to the European art collector elite in Switzerland. It took me over the Atlantic and invited me into underground farmers markets in California. Diverse to say the least. But most of all it has made me realize the value of the most simple and essential things that surround me. And if I am honest, I think that this is the most valuable lesson that The Bread Exchange project has taught me. Until early September you can pre-order the book here on the blog. To get in touch with your local distributor or to order online in your market you can find a list of retailers here. Here you can read more about how it all started. Jag är en matnörd med fokus på bakning som bloggar lite på ämnet. 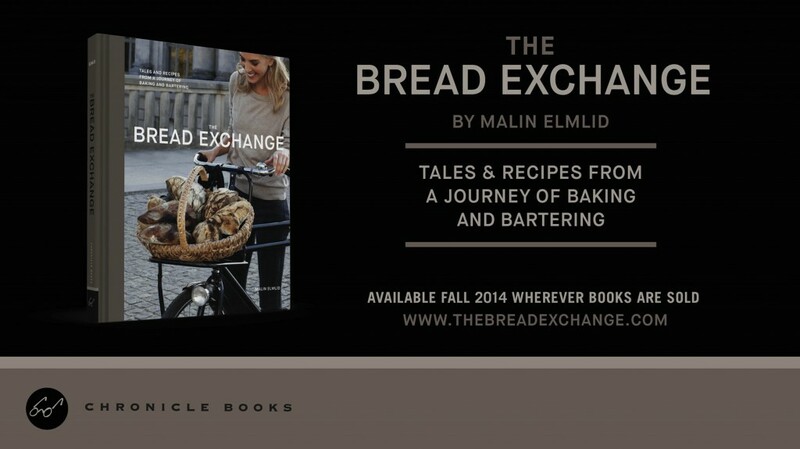 Jag hittade just hit och läste om din bok och ditt fantastiska initiativ med “the bread exchange”. Jag blev väldigt inspirerad och undrar därför om du tycker att det är okej att jag drar igång någon typ av utmaning fast med bakverk bland mat/bakbloggare med hänvisning till dig och din sida som inspirationskälla? Jag önskar dig all lycka med boken! Hej Linda! Later spannande! Jag har mailat dig direkt!